7 th Grade. 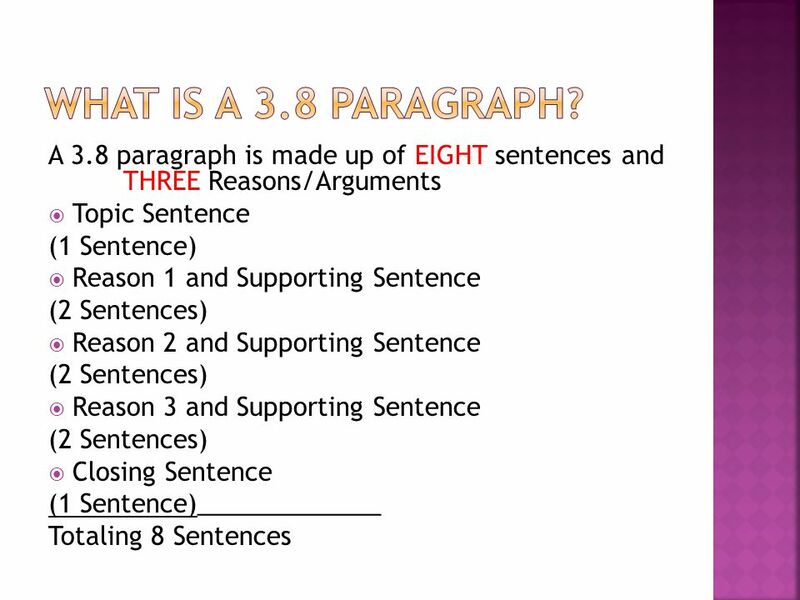 A 3.8 paragraph is made up of EIGHT sentences and THREE Reasons/Arguments  Topic Sentence (1 Sentence)  Reason 1 and Supporting Sentence. 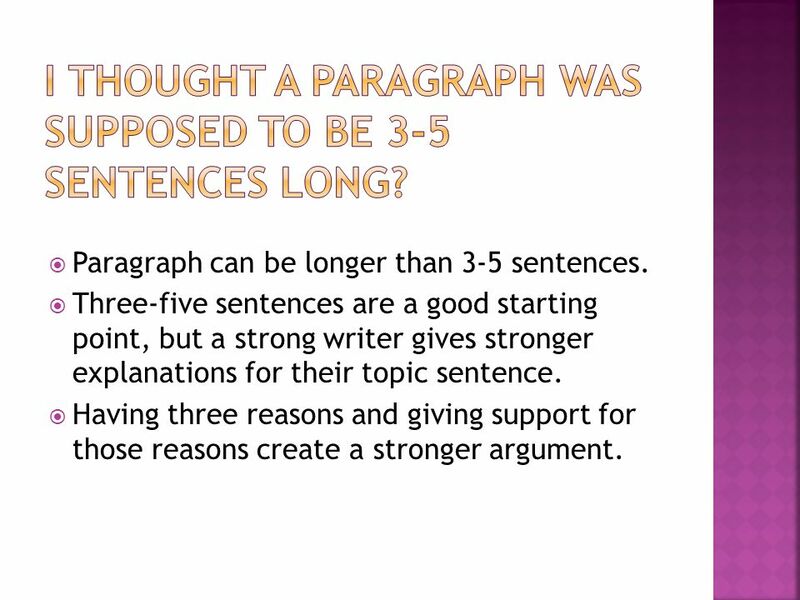 3  Paragraph can be longer than 3-5 sentences.  Three-five sentences are a good starting point, but a strong writer gives stronger explanations for their topic sentence.  Having three reasons and giving support for those reasons create a stronger argument. 4 While many may disagree, I believe Duke is the best basketball team in the NCAA. Last year, Duke won the 2010 NCAA tournament. Although they did not play them, Duke beat out the Kentucky Wildcats who were considered to be the number one team in the nation. They are an experienced team. Duke has won four National Championships. They also have a winning coach. Coach K boasts over 880 wins. Come March, Duke will once again prove to the non-believers that they are the BEST. 5  Get out your worksheet with two paragraphs. 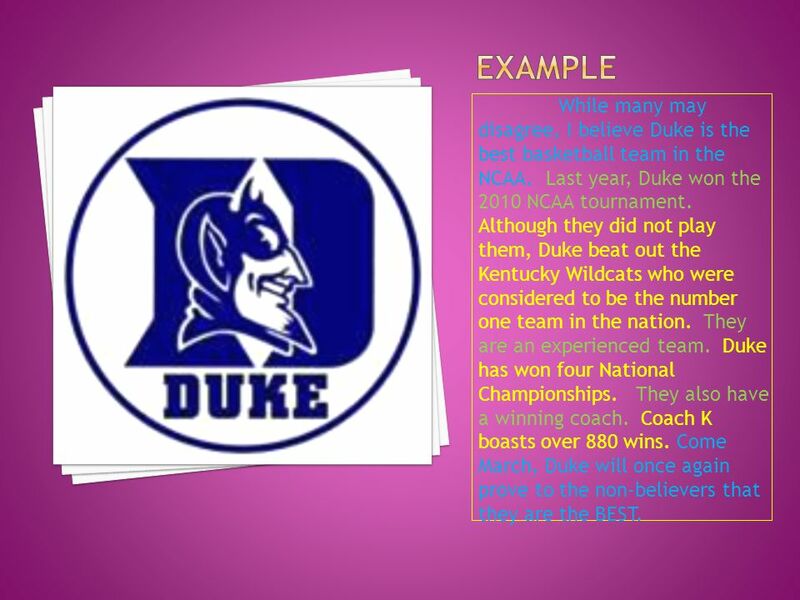  Highlight the topic sentence and closing sentence with one highlighter. Highlight the three reasons with another highlighter. Highlight the supporting sentences with a third highlighter. Each highlighter should be a different color. 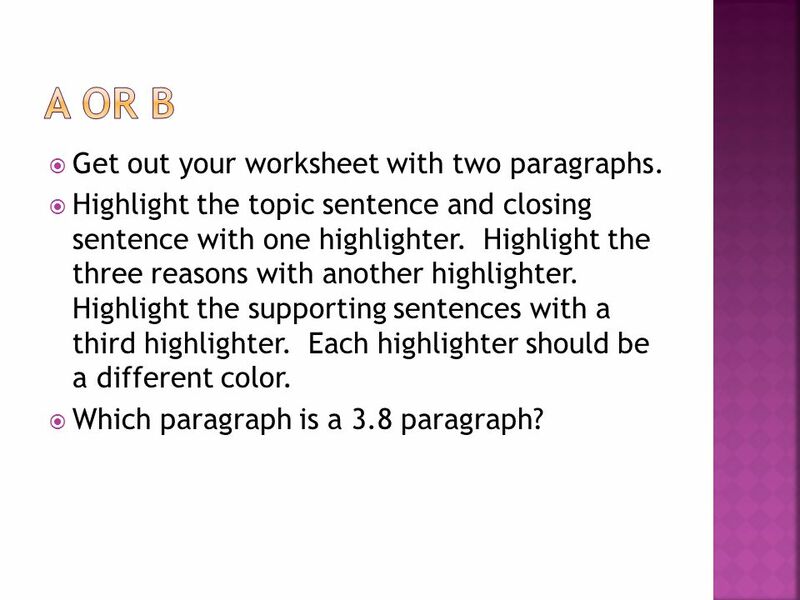  Which paragraph is a 3.8 paragraph? 6 The main reason kids need uniforms is that uniforms make life easier for everyone. First of all, if kids wore uniforms they would be on time for school. Picking out clothes for school would be a snap since they wouldn’t have to make decisions about what to wear. Uniforms would make things easier for parents too. If all kids wore khakis and button-down shirts, parents wouldn’t have to buy them so many different kinds of clothes. Finally, uniforms would make things easier for teachers. If kids wore uniforms to school, there wouldn’t be so many fights on the playground. Everyone would have the same clothes and no one would get teased because of what they wore. 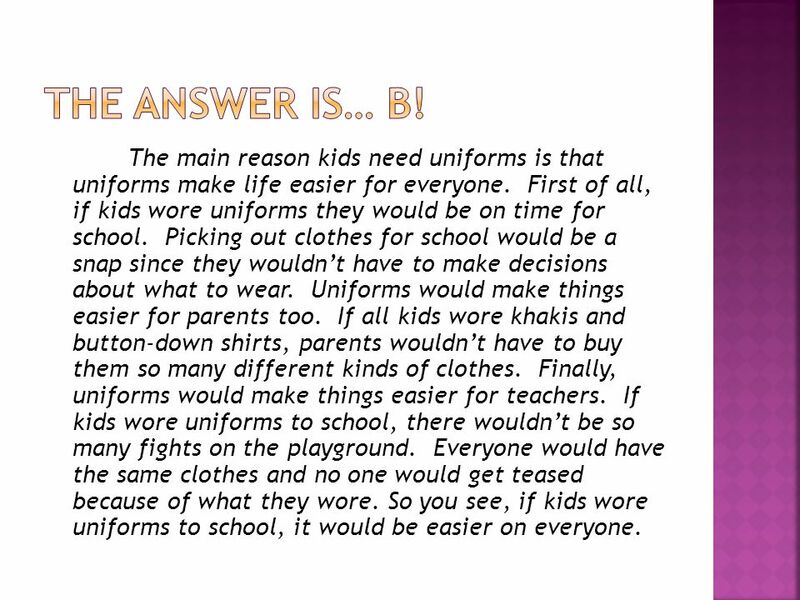 So you see, if kids wore uniforms to school, it would be easier on everyone. 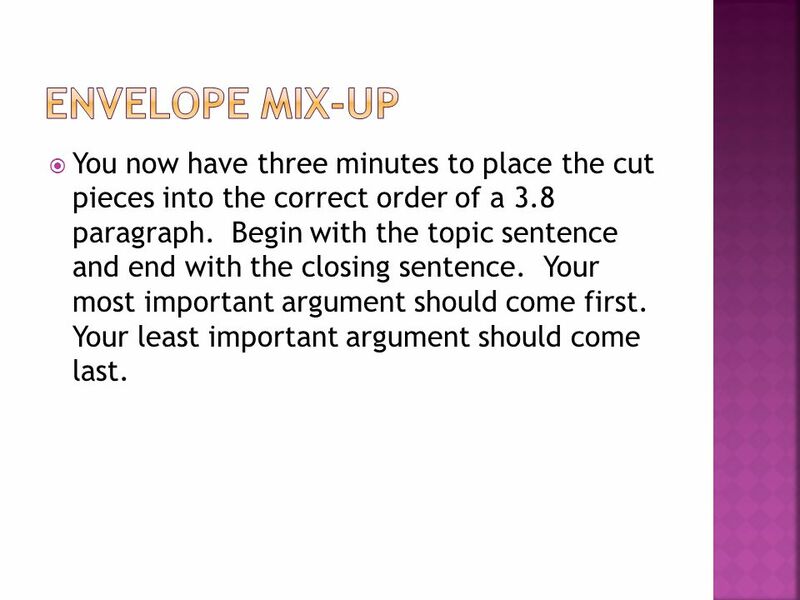 7  You now have three minutes to place the cut pieces into the correct order of a 3.8 paragraph. Begin with the topic sentence and end with the closing sentence. Your most important argument should come first. Your least important argument should come last. 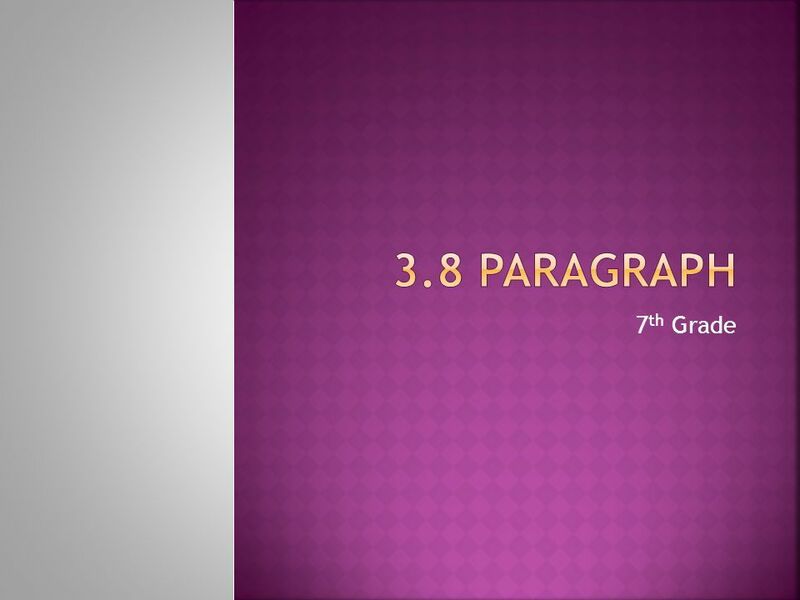 Download ppt "7 th Grade. A 3.8 paragraph is made up of EIGHT sentences and THREE Reasons/Arguments  Topic Sentence (1 Sentence)  Reason 1 and Supporting Sentence." NCAA Mens Basketball Tournament The 64 teams that play in the elimination rounds are divided into four groups of 16 teams. The four groups represent the. Or: Another Tool For Brainstorming. The students will use a graphic organizer to plan an essay The students will use the information from the graphic. DEVELOPING THE LITERACY NARRATIVE. Memory Jogs  Did anyone in your home write/text/play sports/listen to music, etc…?  Who were the people who had a. Writing Tasks on the Literacy Test  On the literacy test, you will have two long writing tasks  1) A News Report  and  2) A Series of Paragraphs (Opinion. Building a Body Paragraph. What does a body paragraph start with? A. A transition word and thesis statement B. A topic sentence C. A transition word and. HSPA Language Arts. The HSPA is an exam administered statewide in March to high school juniors. It is designed to test our students’ proficiencies in. Thesis Statements. What is a thesis statement? A thesis statement is the main idea of an essay. It is often a point you want to argue or support in an. Speech Tournament 2013 March 2, Station Campus. MRS MONTELEONE ’ S. The NCAA Basketball Tournament, sometimes better known as "March Madness", is thought by some sports fans to be one of the most exciting.